Newmont Mining is employing more autonomous LHDs in its underground gold mines in Nevada. Newmont Mining completed its Northwest Exodus project in Nevada, extending mine life from the Exodus underground operation in the Carlin North area for 10 years. The project was completed safely, ahead of schedule and within a budget of $69 million. Featuring fit-for-purpose technologies to enhance safety, productivity and efficiency, Northwest Exodus will add between 50,000 ounces per year (oz/y) and 75,000 oz/y of gold production and lower Carlin’s all-in sustaining costs by approximately $25/oz in the first five years of operation. The mine’s underground infrastructure also provides exploration platforms to support future growth in a highly prospective gold district. The project was designed to support autonomous operations and is currently running two autonomous mobile loaders and pilot-testing autonomous drills to access and recover ore. The operation is also fitted with reliable, high-bandwidth underground Wi-Fi to connect people, systems and equipment. In related news, Newmont reported it has also achieved commercial production at its Twin Creeks Underground expansion project, adding higher-grade, lower-cost gold production at its Twin Creeks operation in Nevada. The project was completed on schedule for $42 million, slightly below guidance of between $45 million and $55 million. The Twin Creeks Underground mine will add between 30,000 oz and 40,000 oz of gold production per year at all-in sustaining costs of between $650/oz and $750/oz for its first five years of production. This new ore will also allow Newmont to process stockpiled ore that had previously been classified as waste, and extend processing life to 2030. 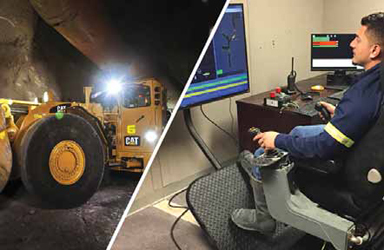 The Twin Underground mine is mechanized, featuring remotely operated loaders to improve safety and efficiency. Twin Underground ore will also be blended with ore from Turquoise Ridge. In early 2018, Newmont and Barrick Gold approved the Turquoise Ridge Mine Optimization project, which involves sinking a production shaft to access the richest part of the deposit. The new shaft is expected to increase ventilation capacity and lower unit costs by more than 20%, while increasing ore production rates to at least 1.1 million tons per year when it comes online in 2022. Over the last five years, Newmont has built six new mines and expansions on four continents, including Akyem and the Phoenix Copper Leach in 2013, Merian and Long Canyon in 2016, and Tanami in 2017. The company also completed a value-accretive acquisition of Cripple Creek and Victor in 2015 and delivered a profitable expansion at the mine in 2016.